A nursing home that was asked by the CQC to improve its safety procedures has gone one better and achieved an overall Outstanding rating. Pennington Court nursing home in Leeds was rated Requires Improvement for the Safe key question at its last inspection in November 2015. Having been asked by the regulator to complete an action plan to show how it would improve to a Good rating, the service has not only achieved this but also gained an overall Outstanding. 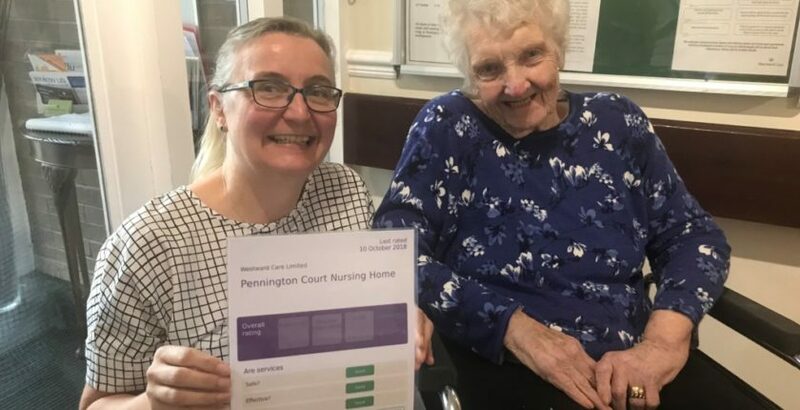 Debbie Westhead, Deputy Chief Inspector of Adult Social Care, said: “It’s great to see a service take our previous findings seriously and make improvements where necessary, in this case an area of safety. However, they have not stopped there and have made further improvements to the service, making it Outstanding overall. “We heard many examples of how the manager led by example, putting people’s needs first and kept staff involved in the design and operation of the service. We also saw how proactive they were; being involved in innovative practice that was trialled at the service, establishing links with local agencies to develop and share best practice and supporting the progress of student nurses. Peter Hodkinson, Managing Director of Westward Care, said: “Our constant focus is to be one of the leading health and social care providers in Leeds and we can only achieve this by living up to our proposition of putting people at the heart of everything we do. To read the inspection report click here.